The kid who could probably legitimately lay claim to being the fittest kid in Australia just happens to be my 18 yo nephew Jack. Brendon used to be a Nursing Sister at St Johns and St Helens Hospitals for goodness sake! he ain’t exactly a manly man! Next up is a staggering 1,200 km solo run around Tasmania that he started this morning at 9 am. He’s running with a 6.5 kg backpack! (3 litres of water + clothes, etc) His only real bit of equipment (apart from his runners, shorts and shirt) is his heart rate monitor – we sell these here at Sinclairs. 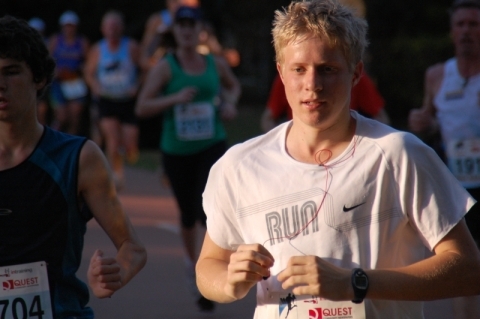 Taking just 27 days, 18 year old Jack plans to run more than a marathon a day to raise money for youth mentoring charity Big Brothers Big Sisters of Australia (BBBS). My 15 yo son Matt and I ran with Jack out of Hobart (we left from the GPO) this morning for about 10 km as he headed on. So if you see a young guy running by himself along a road anywhere up the East Coast over the next few days, be sure to give him a toot and a wave. P.S: Jack finished the run right on schedule 27 days after he started – his longest run was 68 kms between Exter and Devonport. His first day was a staggering 56 kms from Hobart to Buckland! Read more about Jack here.